On the quest for a child, she’ll face her greatest fear! Warlon –the Kingdom of magic ruled by King Thomas where shifters, human and mages live peacefully together. Unfortunately for Daria, her allotted place was decided by her father’s reputation. Remigius ran away with the King’s wife. As the daughter of the wife-thief, she’s been made to suffer for her father’s transgressions, pushed to the edges of proper society. When a vampire kidnaps a human child, Daria volunteers to go in search. The promise of learning magic is enough to entice her. It is her one chance to go from being a scullery maid to becoming someone else–maybe even a prince’s true love. 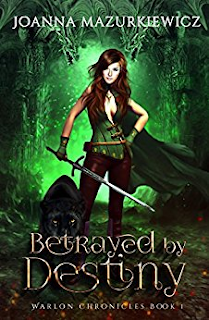 Along with the drunken elf, a prince and her panther Bruce, Daria sets off on the adventure that could change her life forever.